Organic moringa leaf extract is a dietary supplementproduced from the plant Moringa oleifera, traditionally-recognised for its exceptional nutritional value and ability to reduce levels of sugar and lipids in the blood. It’s an aqueous extract made from organically-grown Moringa leaves. 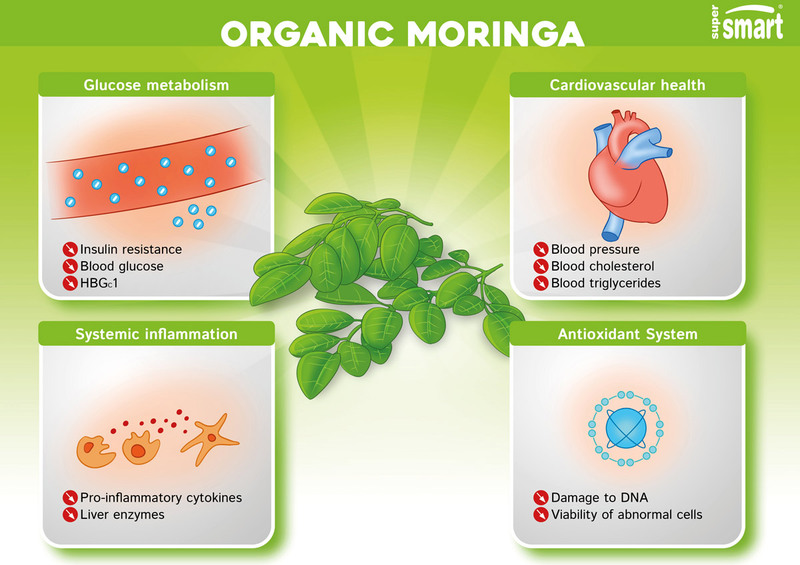 What benefits does Organic moringa leaf extract offer? Moringa has attracted significant interest among the scientific community. Every year, dozens of studies are published highlighting the therapeutic potential of the plant’s leaves (1), confirming the empirical evidence that has accumulated over thousands of years. It helps lower blood sugar levels. Like berberine, Moringa helps reduce fasting and post-prandial glycaemia levels. In one clinical study (2) of type 2 diabetics, 40 days’ supplementation reduced participants’ glycaemia by around 30%. This effect may be due to the isothiocyanate compounds in Moringa leaves which increase insulin sensitivity in peripheral tissues (3) and reduce activity of intestinal sucrase. It combats processes linked to inflammation. Inflammation is one of the body’s defence mechanisms, but if it persists for a long time, it becomes pathological, triggering and exacerbating a number of chronic health problems. Moringa inhibits the production of pro-inflammatory cytokines by macrophages and reduces the activity of genes involved in inflammation (4-5). These anti-inflammatory properties are due mainly to the presence of isothiocyanate and terpenoid compounds. It lowers blood cholesterol levels. One clinical study (6) showed that supplementing for 50 days reduced total serum cholesterol levels by 2% and increased ‘good’ HDL-cholesterol by 7%. 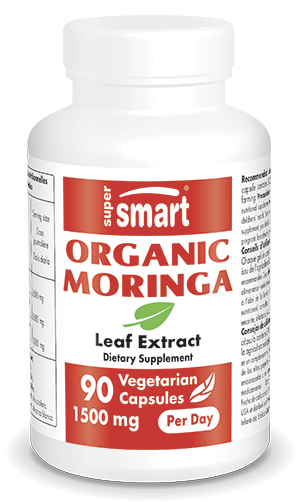 Since increased LDL-cholesterol levels are known to impair healthy cardiac muscle function, Moringa’s lipid-lowering effects thus help improve cardiovascular health. Here, it’s the plant’s phenol and flavonoid compounds which are likely to be responsible (7). They appear to inhibit two key enzymes involved in cholesterol metabolism: lipase and cholesterol esterase (8). (8). It helps inhibit neurodegeneration. This mechanism of action is probably due to its high content of polyphenols and other antioxidants which reduce oxidative stress (9). Moringa is a plant that has been recognised, used and valued for thousands of years in traditional Ayurvedic medicine. It’s the only genus in the plant family Moringaceae and is grown in the world’s tropical regions and in Madagascar, primarily for the exceptional nutritional value of its leaves (10-11). These contain vitamins (particularly vitamins C, B6 and B2), minerals (primarily iron and magnesium), important amino acids and fatty acids (12-3), as well as precious antioxidants including rare carotenoids, flavonoids and phenols (14). Several studies have shown that Moringa leaves were used for their anti-inflammatory (17), anti-hypertensive (18), diuretic, antimicrobial (10), antioxidant (20), anti-hyperlipidaemic (21), cardio-protective and liver-protective (22-23) properties. According to Ayurvedic medicine practitioners, Moringa may prevent more than 300 diseases (24) ! What is in Organic moringa leaf extract ? Organic Moringa leaf extract is an aqueous extract made from the plant’s leaves. Polyphenols, including flavonoids and phenolic acids. The principal flavonoids are quercetin, rutin, chlorogenic acid, kaempferol, myricetin and benzylamine (moringine) (25), while the most abundant phenolic acids are salicylic, gallic, coumarinic and caffeic acid (26) as well as chlorogenic acid. The latter plays a role in glucose metabolism: it is at least partly responsible for the anti-diabetes properties of the extract (27-28). Alkaloids, in particular glucosinolates and isothiocyanates, which are primarily responsible for Moringa’s anti-inflammatory effects. Saponins, which reduce cholesterol absorption by binding to molecules and acids in bile (29). In 2007, researchers examined the active principles of Moringa oleifera leaves (30). They found that two additional molecules, niazarin and niaziridin, increase the biological activity of the antibiotic compounds and facilitate gastrointestinal absorption of the vitamins and other micronutrients present in the leaves. How should Organic Moringa leaf extract be taken? The recommended dose is three capsules a day, to be taken with food, for at least five weeks. Olive Leaf Extract, a Mediterranean triple-action formulation against cholesterol. Each capsule contains 500mg of 4:1 extract of organically-grown Moringa oleifera leaf.